DESCRIPTION: This contains the Windows XP driver for the Compaq iPAQ Wireless USB Adapter, for use with any computer running Windows XP that has a USB port. 1. Download the SoftPaq to a directory on your hard drive.The file downloaded is a self-extracting executable with a filename based on the SoftPaq Number above. 2. Execute the SoftPaq by double clicking on the SoftPaq executable file. 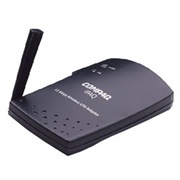 I have a Compaq HNW-200 11 Mbps Wireless USB Adapter. The adapter fell off my desk and the antenna broke away from the adapter. It is still attached to the adapter by the wire, but the antenna will not stay in the up position. Now I cannot connect to the internet by wireless connection to the computer in another room. Is the broken off antenna the probable source of my problem?